Walnut is a unique material and yields beautiful results in flooring! There are times when nothing else will do but Walnut as it has certain traits that make it unique. Walnut flooring has a grain pattern that is fairly strong and bold. All our walnut floors are steamed before milling. What does that mean? Walnut naturally is a darker material with varying tones and colours. It’s not uncommon to have white streaks running through some of the boards. For the majority of us, these white streaks or the sapwood is too white. It’s too much of a contrast when compared to the darker areas of a given board. By steaming the walnut, the pigments of the darker areas of the boards go into the sapwood and therefore darken the lighter areas. The end result is a floor full of tonal variation that is pleasing to the eyes, without being overwhelming. It’s beautiful in its natural colour, and this is the most common way to finish it. Without stain, walnut flooring has a wide range of colour. Commonly, there are many shades of brown tones, different hues of darker golden, and slight hints of red throughout each unique board. Walnut flooring can be stained many colours to fit a desired look. Most commonly, they are finished in their natural colour. Depending on the appearance we are going for, the walnut is finished in either a water-based sealer, or an oil-based sealer. At times, stains are used to obtain a very special look with the walnut. Some variations are white washing to varying degrees, grey washing to varying degrees, or adding a little bit of richer brown to even out the natural colour just a little bit more. Most often, No.1 common is used for the grade of the walnut. It’s slightly rustic without being over the top. Sometimes though, only select grade will do. Walnut flooring is a great option for those who want a truly unique floor and want the natural warmth and richness of walnut. 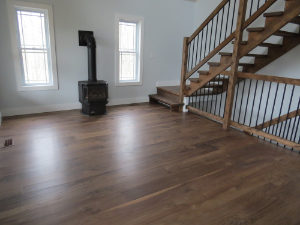 It can be a rustic plank floor, yet at the same time have a tamed formal appearance. Although it ranks lower in the janka scale, it holds up incredibly well when there is texture on the top. With the texture, it’s a great option for dogs, children, active lifestyles, and for those who don’t want to needlessly worry about their floors. It’s suitable just about anywhere and can be installed in your place of business, such as office spaces, restaurants, or in your home or condo. Dents, scratches, scraps, wear and tear, and abuse are no match for Walnut flooring that has textured saw marks. There are even options with regards to the appearance of a textured top floor. The saw marks can be sanded so that they aren’t rough, yet they are still visible. Another option is to fill the saw marks. What this does is give the illusion of a textured floor but in reality, it’s nearly flat as the filler has filled in the saw marks. The filler can be stained to blend into the wood, or it can be tinted to give a contrasting appearance. Would you like texture but you don’t want the saw marks? There are options! Initially, we install it with a flat top. After installation and during the finishing phase, we can add more subtle texture. With this process, texture is added and makes the Walnut flooring more forgiving to live with, and adds to the unique beauty.